If you have been yearning to try your hand on wooden art, then you may need a wood lathe. But selecting from a set of different products can be tasking – even a source of a headache as you try to read through the jargon. One timeless tip you should stick to no matter what is to stay away from the cheap stuff. They may be good entry level machines, but you don’t want something that will fail you along the way. If you think about, cheap is actually expensive in the long run. Ideally, you should choose an ideal wood lathe that will give you a significant amount of service years. Among the highlight features for the Shop Fox W1704, lathe includes the 1/3 horsepower motor, adequate for the majority of woodworking projects you may have. Ideally, this is the minimum power a wood lathe should have. The ability to vary the speed is quite remarkable as it hands you the control over the woodworking project. This benchtop lathe has a sped control knob that you use to change the speed as is necessary. It is lightweight, favorably-priced and comes with easy to use wooden handles. Whether you are just starting out or a pro, this is actually one machine that will be a good companion in your woodworking DIYs. 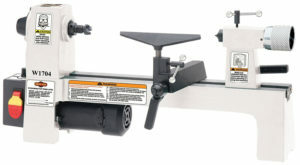 This lathe comes with a 1/3 HP motor, efficient for the majority of woodworking projects you may have at home. Even though this power may be less by some standards, it is sufficient for low and medium level types of woodworking. Constructed from cast iron body for added durability and stability to overcome associated shock and vibration as you work. Lathes must be built in a way that makes it easy to work with even when dealing with hardwood. The lathe comes with a good alignment that your only task is to make use of the machine. This makes it all easy for you regardless whether you are a beginner or not – you will not have to figure out where each component goes. Comes with a faceplate and two tool rest making the tool genuinely functional for your projects. It would be a different story if they were missing. Weighs only 45lbs, relatively lightweight to carry around to a place of your choice. However, it is also solid enough to ensure a stable workbench – very lightweight would be challenging to work with especially when it comes to woodturning. The centers are 12 inches apart, and the swing is only 8 inches, adequate for turning those small pieces. It is quite an affordable piece that it will leave you with some pocket change. As a beginner, you try your best to ensure a reasonable investment that isn’t too costly – you may be trying out. Variable speed on a lathe is always a good thing. Specifically, this tool has a variable speed of 600-3300 RPM for enhanced control and efficiency when working. Reliability and efficiency are some of the most fundamental qualities to achieve safety. An inefficient machine is one that is mostly built using cheap materials. The result of that is usually bad quality pieces and risks to the user. However, this lathe is well-built, and that ensures your safety in addition to efficiency. Some features that this lathe boasts such as a variable speed contribute in a way to your safety when using the machine. You can view this way, a lathe that has an uncontrollable speed forces you to make specific maneuvers to make good finishes – this can be pretty dangerous. A good alignment off the box is something to be celebrated about this product – don’t you agree? This saves you from the hassle of having to peer through the manual trying to figure out what goes where – that is what safety is all about. The lathe has a compact size and is relatively lightweight. This means that it is only good for small DIYs at home. This is pretty limiting as you may need to try something different when you feel your creativity is building up. Reviewers have reported parts falling apart in the middle of the job. The brass molded elements may not have adequate strength to overcome the constant shock and vibrations associated with an extended period of use. The tailstock may also have specific issues. The motor isn’t powerful enough to handle individual common projects. Interestingly, the machine quickly comes to a stop when pressure is applied – not a good thing! Some of the qualities making this one of the top mini wood lathes include variable speed, solid build, and favorable pricing. As a matter of fact, the lathe is easy to use that any beginner can comfortably use it without any problem whatsoever – the pride of beginners.